Paimpol, a town on the northern coast of Brittany in north-west France, is notable for several reasons. The first thing that strikes you is the unusual colour of the dramatic cliffs which mark the boundary between land and sea. These cliffs are of a beautiful pink granite rock, and this adds a distinctive beauty and character to Paimpol. Another notable feature of Paimpol are its oyster beds, which provide a substantial portion of the town's economy, and if you are a lover of oysters and other shellfish there can be no better place to be than Paimpol, where the slippery delicacies are sold in almost every shop and restaurant. The town itself is an attractive place with character-filled narrow streets and half-timbered buildings, many of which house the colourful shops where local specialities such as oysters, other seafoods and Breton pastries can be purchased. Try also seeking out traditional Breton clothing such as the thick knit fisherman's jerseys which make an ideal gift for the poor folk stuck back in chilly old Britain! There are plenty of restaurants in Paimpol too, with seafood being the obvious choice on the best menus! Most other facilities are present, with the town being well equipped with necessities such as schools, doctors and banks. The huge fishing fleets of old are long gone, but you can still see some fishing boats bringing home the catch to Paimpol harbour. The Marina is now more a place for pleasure craft, and indeed, an interesting trip can be taken on board an old tunny boat, "Le Vieux Copain" (the Old Pal) in the holiday season. The town's seafaring past is immortalised in many ways. There is a famous book written by Pierre Loti called Pêcheur d'Island, and also a well known song, "La Paimploise". Paimpol also commemorates its sailors who were drowned in Icelandic waters in a special festival in which the townsfolk parade through the streets each summer. Other festivals include a three yearly celebration of the Coquilles Saint Jacques (almost as beloved here as the oyster! ), and a great celebration of all things to do with the sea, when lovers of the sea and musicians and dancers from all over the world come to Paimpol for a three-day festival. This takes place on alternate years, and is a must see if you get the chance. The coastal paths which run around the town's edges are wonderful for walking and appreciating the glorious seascapes. The cliff paths offer some amazing views, particularly over the pretty island of Bréhat. Many sports are available in or near to Paimpol, with a good golf course (including a driving range and a pitch and putt option) and an excellent equestrian centre for pony trekking. Sea sports are popular too, of course, and there are sailing schools and opportunities for windsurfing and swimming. If you have time to spend in Paimpol, you might like to visit the beautiful Beauport Abbey, built in the 13th century by Alain Goelo. Beautifully restored, and lying in some 98 acres (40 hectares) of glorious park, this is a place well worth seeing and enjoying. To fly to Paimpol you can choose between taking Ryanair or Aurigny to Dinard or Ryanair or flybe to Brest. The ferry will take you to the nearby ports of St Malo and Roscoff, or you can choose to travel a little further after disembarking at Caen, Cherbourg or Le Havre. Property in Paimpol is sought after, which tends to push prices up. However, as the town is on the coast, easily accessible from the UK and blessed with charm and good facilities, if you are looking to maximise your investment with a rental income you could be onto a winner with a property here. 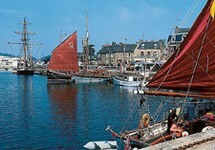 Paimpol is also a good place to consider establishing a bed and breakfast or gîtes business. Do you know Paimpol better than we do? Do you have photos of Paimpol? Paimpol is located in north-west France, on the coast looking out towards the Channel islands. It lies in the north-west of the Côtes-d'Armor department. Access: By air: Fly to Dinard (Ryanair, Aurigny) or to Brest (flybe, Ryanair). By boat: The ferry ports of St Malo and Roscoff are the nearest, but it is an easy drive from the ports of Caen, Cherbourg and Le Havre should these suit you better. Economy: The economy is based on oysters and shellfish. Also significant are tourism, boat building and tomatoes! Interesting fact: Paimpol is always remembered for the hardships suffered at sea by its fishermen who were drowned in Icelandic waters.